So, according to Japanese politician Ichiro Ozawa, Americans are “simple-minded.” Of course, one is now forced to wonder about the intelligence of the Japanese, seeing as anyone with half a brain cell would know better than to make that kind of a statement. What a winner! Well, recent news of the arrest by the United States government of 12 people accused of spying for Russia has to be one of the more surreal news moments of recent memory. This is the sort of thing you expect to read about in fiction or see on a television show of the scripted variety. Emerging reports indicate that the accused spies hid the information they were sending in digital pictures. Apparently this sort of thing has been a fear of counter-intelligence types for quite awhile. In a way, it really is quite brilliant. Hiding messages in the digital code of a picture without altering the image itself allows only those who know there is something more too look for to find the information. As the linked news article points out, file sizes limit how much information can be transmitted this way, but it just goes to show that even with the Cold War a thing of the past, a spy’s work is never done. Now where’s James Bond when we need him? Uh Oh, Now Daddy is Mad . . .
Well, since I’ve been following the North Korea situation pretty closely, it seems appropriate to mention the latest developments, which may actually be a good sign. North Korea has always counted on China to provide it protection from those “Horrible, Mean Western Aggressors,” and China has been all too willing to use North Korea as something of a buffer against interference – particularly from the United States – in continental Asia. Perhaps U.S. influence in Japan and the events of the Korean War hardened China’s position, and that is understandable on some level. Whatever the case, China has often served as the biggest obstacle to holding Kim Jong Il and North Korea responsible for their activities. If China is truly willing to stand with the rest of the world in condemning North Korea for the craven torpedo attack on the South Korean ship, then perhaps progress can finally be made. Lets hope that these leaks about China’s willingness to accept the independent investigation’s conclusion that North Korea was in fact responsible is a sign that North Korea’s proverbial father, always overbearing and overprotective, is finally ready to punish his little boy for relentlessly pushing the buttons of all the other kids. Anyone for a spanking? North Korea is at it again. The annoying child that keeps pushing buttons now wants to play the offended and aggrieved party. It would almost be laughable if not for how dangerously unstable the country’s so-called leaders seem to be. Kim Jong Il and his backers long ago left reason behind, and soon enough South Korea and probably the rest of the world are going to have to make a decision about what can be tolerated and what must be punished. Maybe the time has come for the petulant child to get the spanking it needs. Let’s just all hope that the price for indulging North Korea this long does not come back to haunt us all. You are worthless Alec Baldwin . . .
Looks like North Korea is making friends again, this time sinking a South Korean warship with a torpedo fired from one of their submarines. Somewhere, Kim Jong Il is laughing even as his ministers threaten all-out war if anyone tries to hold North Korea responsible for what they did. So why would North Korea’s leader be laughing? 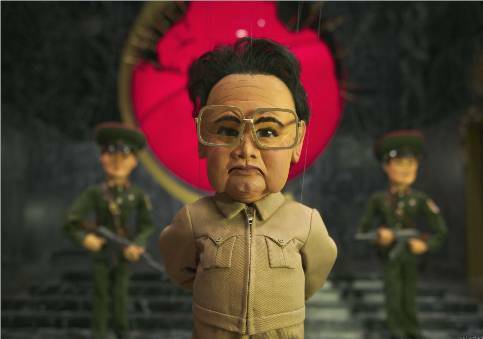 The truth is that Kim Jong Il knows that the international community won’t do anything about it other than talk tough. How many times has North Korea provoked anger and gotten away without any real consequences? Why would they believe that this time is likely to be any different? The thing is, Hillary is right, even though I don’t think we’ll see any action to back up those words. North Korea essentially committed an act of war and should be held responsible for what they did, but somehow I don’t see anything meaningful being done about it. All of that means of course that North Korea will continue to push buttons and provoke until there is no other option than full fledged war. If a child never learns the consequences of misbehavior, that child will continue to misbehave. North Korea is no different.